THRILLS AND CHILLS IN THE STEARMAN BI-PLANE TRAINER. From the time you enter into the navy flight program your burning goal is to get in the cockpit and begin flying. Primary Flight Training is where the aspiring cadet got his first taste of this. At that time (November 1945), all primary training was done at Glenview Naval Air Station, which is not too many miles north of Chicago. I arrived at Glenview in late November 1945 and as you can imagine, it was freezing. 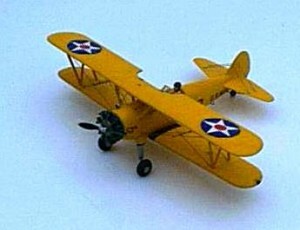 The aircraft they were then flying was the redoubtable N2S, or as it was commonly called, “the Yellow Peril”. This little biplane was a great bird, but it had its limitations. For one thing it had open cockpits, and no heat, so the “old-timers” told me to go down to flight gear issue and get some good winter flying gear. I did just that. I got a shearling lined flight suit, a shearling lined flight jacket with a high fur collar, shearling lined boots and gloves. Now, I was ready for my first flight. Couple more flights and I was ready for my solo. The training field at Glenview was a huge circular mat and the landing direction was indicated by a prominent tetrahedron off to the side, so instead of paralleling the runway to make a landing you came in via a fairly broad funnel. The airfield side of the funnel was marked by a long stone wall, which we were forbidden to cross. When my flight ended and I was ready to land I got into the middle of the funnel, sweating a little, but feeling like Lindbergh over Paris, and hoping that I would do this thing right. Then I felt a presence on my starboard side. Whoha! Here was some guy flying formation on me. Understandably, on my first solo flight this made me uncomfortable – too close – so I jigged to the left to shake him loose. He jigged too. Jig again, and ditto again. Same thing couple more times, but now I am over the dreaded wall, which I am forbidden to cross. Long story short, that guy stayed on my wing until I was almost ready to flare, then he jigged right and disappeared. Thank you buddy that was a confidence builder! Now for the inverted spin. If you’ve never done one, you have not yet lived. We climbed to about 5000 feet, and I receive my instructions through the Gosport. “This is a confidence builder (another one). I’m going to roll this thing inverted, push the nose up and go into an upside-down spin. You’ll be hanging from your seatbelt, and to let me know that you’re not holding on to something I want you to take both hands and thumb your nose at me.” I was innocent, so I shook my head yes, and he rolled over. YOWEE! I wasn’t hanging by my belt I was swinging from it, and the world outside was swinging around crazily. At the same time my two hands were flailing the air in front of my face trying to thumb my nose at this guy. Well, he finally pulled out and resumed normal flight, then he said, “ I didn’t see you thumb your nose at me. Let’s do it again!” This time, I gave him my answer. You can’t talk back through a Gosport, but my head was violently shaking “no” and my hands were scrubbing the air in a negative gesture. He laughed and we headed back to the barn. (years later my kids made me take a run on a “zip” drive in Park City, Utah. They laughingly wanted to scare the old man. Fat chance!!! So this was primary training. Fifty five hours during which we not only learned to fly , but became proficient in all sorts of cross-wind and emergency landings like making tight slipping “S” terms to a circle from 800 feet after the instructor unexpectedly cut the engine; and pretty much mastering all sorts of aerobatics from loops and spins and Immelmann’s, to slow-roles and snap-rolls, and falling leaves, and yes- inverted-spins –Confession time: I only did one solo and I started that at 8,000 feet while I prayed. Probably the closest I came to permanently ending my flying carer and my life came when I did my first solo snap-roll. I still shudder when I think of it. A snap-roll is accomplished by picking up speed, jerking the stick back into your lap and at the same time pushing hard on one of the rudder pedals. Essentially you have “snapped” the ship into a horizontal spin/stall and the pushed pedal rolls it. Done properly you then slam the stick back forward when the roll completes, neutralize the rudder pedals and you should resume level flight. Luckily I was nervous about this maneuver, so instead of beginning it at 5,000 feet I continued climbing until I reached 10,000. Now, as I mentioned, we were supposed to pick up speed before executing the procedure so I remember that I added full throttle just before starting and went into a shallow dive. – O.K., here goes. Wham – stick back, rudder pushed, plane rolls – oops! missed the neutralizing point and now in a full-blown spin heading downward. O.K. we had been taught spin recovery. Stick back, opposite rudder, push stick forward and that should do it. But it didn’t! Still spinning. Try again! Nope. Suddenly the dawn. Cut the damned throttle dummy. NOW, stick back, stick forward, opposite rudder -zoooooom-out of spin. Phew! Level flight – now where are we? – WHAT? 2,300 feet. That’s 7,700 feet below where I started. Yow! I was supposed to have started at 5,000 feet. Thank you God! Ground loops! This was the thing you didn’t want to do. A ground loop is just that. You land the plane and then lose control for a second and instead of going straight the plane does a 180 degree turn on the mat, momentum tips the bird sideways and you drag a wing. Well, I was determined that this would not happen to me. Well, it didn’t, but what I was not prepared for was a sudden cross-wind, and that’s what got me. No, I did not do a “ground-loop”. Instead the unexpected wind caught me from the side and tipped the aircraft while I held it straight. I can still see that wing-tip dragging. Nutz! So what was the penalty? Not much. I just had to report to the maintenance hangar that afternoon and learn how to replace the torn fabric on the lower wing-tip. Pot of glue – bit of fabric. Paint on glue – imbed and stretch out the fabric on the wooden tip, then let dry and paint it yellow. That was lesson one in aircraft maintenance. Try that today and stand trial in front of the FAA and a bevy of lawyers – and then be HANGED!